Cracks is a spectacularly competent debut feature by Jordan Scott, a film which is fascinating from beginning to end. Based on the novel by Sheila Kohler, Cracks begins as a simple coming of age tale in a British all-girls boarding school, but slowly it shifts to a quite unpredictable thriller. The unexpected twists and turns of the film come from the complexities of the characters rather than the plot, however. At the beginning of the film, the boarding school seems completely ordinary. 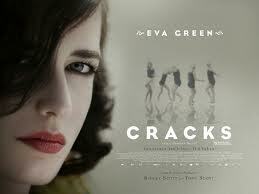 There are a group of girls all in admiration of their favorite teacher, Miss G (Eva Green in a powerful performance). Miss G fills the girls with stories of her own adventures in the world, inspiring them to seek their own exciting lives outside of the walls of the school. When a new girl arrives, however, the cracks in this façade begin to show. The film is shown through the eyes of Di (Juno Temple), the head girl in the diving team and queen B of the school. This all changes with the arrival of Fiamma, a self-assured princess from Spain. Fiamma does not buy into the image that Miss G presents for the girls, finding flaws in her stories and similarities shared with classic literature. The less interested Fiamma is in Miss G, the harder the teacher tries to get the new girl’s admiration, even at the risk of losing her other students.